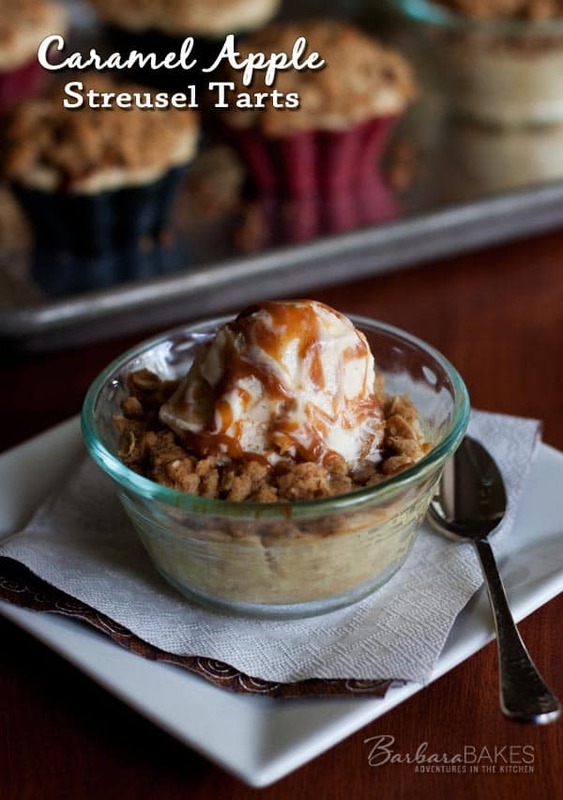 Luscious mini apple tarts layered with caramel and streusel then crowned with ice cream and drizzled with more caramel. A warm and wonderful treat perfect for fall. Caramel apples are a favorite any time of year, but I especially crave them in the fall. After we’ve harvested our pumpkins and cleaned up the garden for winter, I’ll whip up a caramel apple fondue to serve my family for a treat. 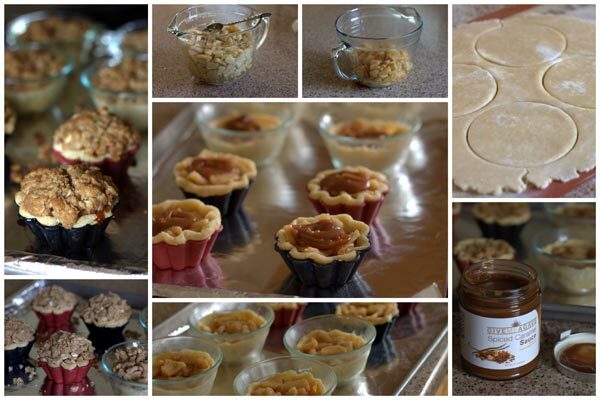 So when I was making some cute little apple tarts, I decided to give them a caramel apple twist too. I used a spiced caramel sauce that I bought this summer in Bermuda. On Wednesday nights in the summer in Hamilton, Bermuda has a Harbor Nights Celebration with music, dancing and street food. One of the booths was sampling this luscious sauce. It’s caramel sauce spiced with cinnamon, star anise, nutmeg and cloves, and it added a wonderful fall touch to my tarts. 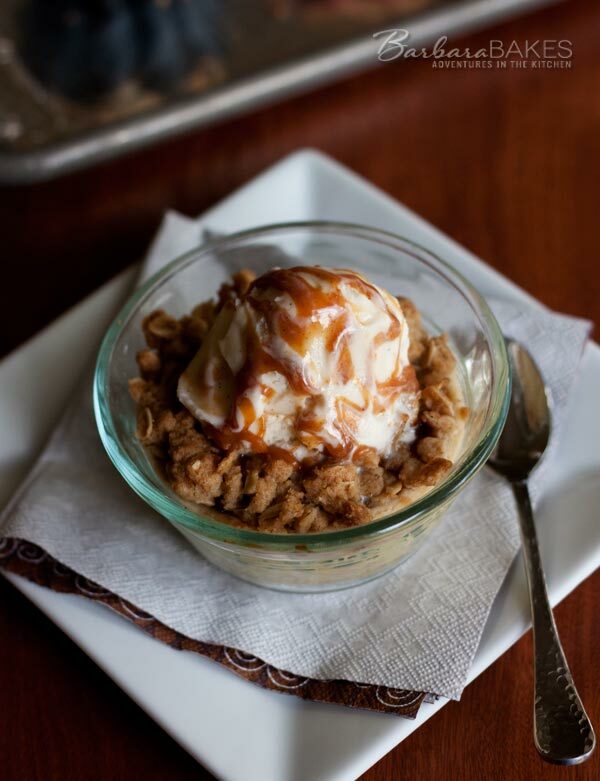 You can use any kind of caramel sauce or thick ice cream topping you like in this recipe. You could even add some spices to your favorite caramel sauce to spice it up for fall.
. You could even make them in muffin tins, if you don’t have custard cups. The crusts didn’t brown up much in the silicone cups, but the crust was perfectly cooked, super flaky and released easily from the cup. I used a 4″ round biscuit cutter to cut the pie crust, which was the perfect size for the fluted baking cups, but I rolled out the crust a little bit larger for the custard cups. The nice thing about making them in the custard cups, was that you could serve it right in the cup. Either way, they’re a scrumptious fall treat that didn’t last long at our house. In a large mixing bowl, combine apples, 1/4 cup sugar, 1 teaspoon cinnamon and fresh lemon juice. Melt the butter in a saute pan over medium heat. Add the apple mixture and saute until apples are softened and juices are thick and syrupy, about 10 to 15 minutes. Pour the cooked apples back in to mixing bowl to cool completely. After they have cooled, the filling can be stored in the refrigerator for up to 3 days. Cut eight 4” rounds from pie crusts and press in to mini tart pans, custard cups or silicone cupcake molds. (Once cut, you can roll the rounds larger if needed to fit your pan.) Prick the bottom and sides of the crust. Fill with apple filling. Drizzle about 1 tablespoon of caramel sauce on top of apple filling. In a medium bowl combine 3/4 cup flour, 1/2 teaspoon cinnamon, brown sugar, 1/4 teaspoon oats, and salt. Cut in butter until mixture is crumbly. Top each tart with a mound of streusel topping. 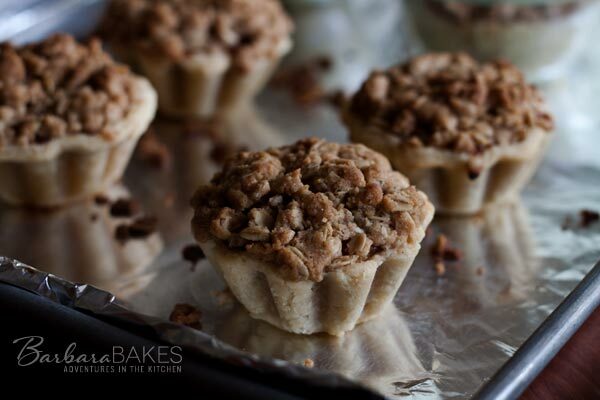 Place tarts on baking sheet and bake for 20-25 minutes until crust and streusel is golden brown. 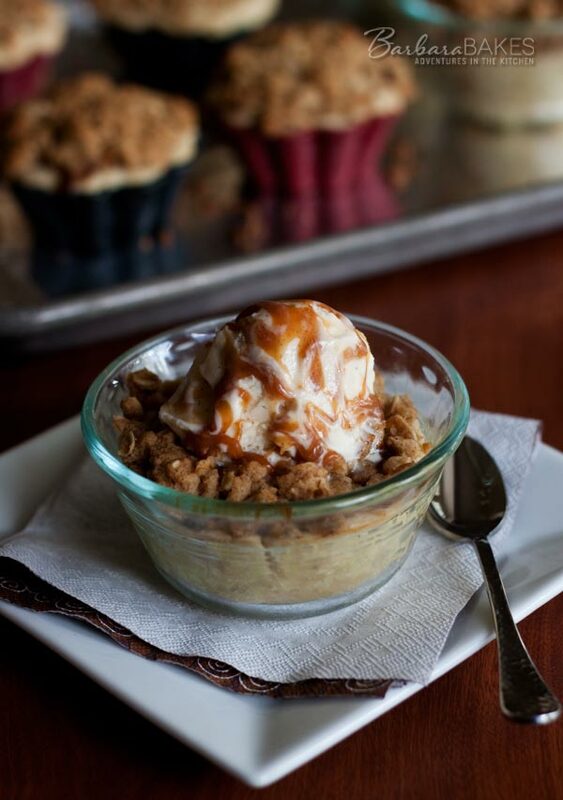 Serve topped with ice cream and a drizzle of caramel sauce. These look delectable and adorable Barbara! The caramel sauce sounds like something special! Love the idea of adding warm spices to caramel. Barbara, these look amazing and I agree with Becca, mini desserts are the most fun. These look absolutely delicious Barbara and so cute too!! It’s caramel apple season for sure! i love bite sized desserts and this is looks like the perfect bite in each bite! wonder if I have any ice cream at home???? They look absolutely delicious Barbara. I bet the aroma coming from your kitchen while these were baking was amazing. I don’t have those pretty silicone baking cups but I do have PLENTY of muffin pans. This tart looks lovely!! Yum! I love the idea of having a whole tart to myself. Yum! Mmm Barbara a delicious idea and perfect for me to make for a dinner party. Also I love Fuji apples, they seem to be the best flavor when baking with apples. I’m singing.. “I’m in heaven.” Wow.. this dessert is really calling my name. Divine! That is such a great idea. A terrific fall dessert.